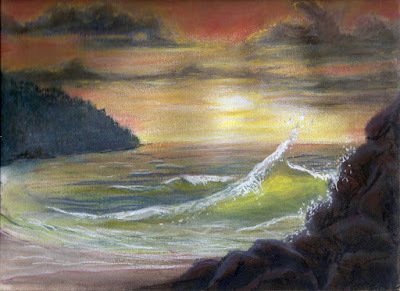 Pastel painting/sketch of Cascade Head, viewed from Proposal Rock, at sunset. Pastels on 9x12 Bristol board smooth. A study for an oil painting I've been wanting to do... Perhaps I should create a new category called "Painting Fail" because this sketch turned out as IT intended rather than what I had in mind. Even so, it gives me some ideas about what I do (and don't) want to do in a larger work. By the way, Proposal Rock is the spot where we lose people every year because of sneaker waves. In fact, you see one coming at you right now! This is just 9 miles from my home base. ...Last year, there was a story about a guy who took his fiance there to propose to her and she got washed away by one of those waves. It was heart-rending enough to make national news. We also lost a middle-aged woman here just last week, but that probably didn't make it to Fark and Drudge. It's like a beautiful death trap. I just thought I'd share that with you. I'm reading: Cascade Head, Proposal Rock Sunset (Pastel)Tweet this! Well, the painting may have come out "as it wanted," but it still looks pretty darn good to me.